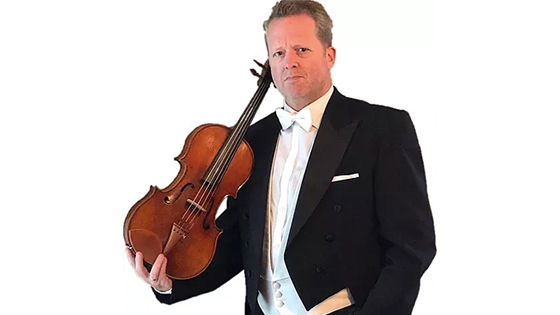 January 28, 2019, 2:25 PM · On Jan. 13, violist Brett Deubner gave the first public performance of the new Viola Concerto written by composer Robert W. Butts, with the Baroque Orchestra of New Jersey, and it was a resounding success for this instrument that is so seldom given the solo spotlight. Violist Brett Deubner. Image courtesy of the artist. "It is an honor to be able to compose a work for a great artist like Brett Deubner. I would like to say a few words about the piece. The concerto is in three movements-each movement in three parts. The theme is the contrasts of life in which change can be sudden and swift, inspiring or painful. This is especially true for movements one and two. The first movement contrasts fast energy and power with a section more reflective and thoughtful. It is in the second movement where life's contrasts hit the most dramatically. The movement starts slowly and expressively. Suddenly, everything is torn apart-as if out of nowhere. Inspiration actually came from the Beethoven Symphony #6-il1 which the storm bursts upon the world and completely rips apart the scherzo. The third movement starts with similar bursts of energy and momentum, with particular emphasis on contrasts from measure to measure of beats of two vs three (hemiola). The energy almost becomes too much and the soloist stops to reflect. The sound of a drum in the distance and a dance melody inspires the soloist to capture the celebratory mood.Gradually, it all coalesces into a Celtic dance in which the entire orchestra joins. The contrast is further emphasized in the finale where the two ideas-the driving momentum and the Celtic dance-play simultaneously. This concerto grew out of Brett Deubner's desire for more Viola Concerto's and Butts' compositional skills. Butts noted that he learned a lot about the Viola as a stand-alone instrument while working with Deubner in the composition process. Butts is continuing the line of composers who hand-write their drafts and do so in public places where the presence of other people, the rhythmic patterns of society are all around. In the original conception, Butts saw the concerto as three movements of three sections each the first being Fast-Slow-Fast, the second Slow-Fast-Slow, and the third became the lynch-pin after hearing the Chieftains perform "Silver Spire" at a local concert. There was a missing part in the orchestra one filled by the bodhrán (Celtic drum) and the fire of Celtic dance. By good fortune Dr. Butts knows a musician who plays the bodhrán and, by the musician's telling is only one of three players who own a tuxedo (yes, that was a joke). Dr. Butts did write an alternate drum part for the timpani in case some orchestra cannot find a bodhrán player. This piece fits in the category called Post-Modern but it just doesn’t sound that way. That is due to the fact that despite having atonal sections, the entire piece is melodic so it doesn’t sound modern despite the a-tonal sections. Deubner noted that while this piece showcases the viola it is anything but easy for the violist. Butts made sure to call upon the full tonal and color range of the viola, which translated into Deubner's fingers moving across the entire expanse of the fingerboard. A local musician noted that she was excited to hear the viola (which she also plays) afforded a very strong presence alongside the orchestra. As a person in the audience, my response to the piece was a bit of awe at the display of both range and color of the viola. (I'm an amateur violinist who never played the viola.) The first two movements went through some very complex orchestral rhythms and passages for the viola, moving back and forth between fast and slow movements as Dr. Butts described. There was some tension building as the second movement came to a conclusion - where was this going? The third movement opens with a dialogue between the viola and bodhrán, with the strings playing a supportive role and then, the bassoons start a low drone as the dialogue gets faster, then the woodwinds assume the role of the chanter and suddenly you're in a pub where the dancing commences. As Brett noted when I interviewed him, the piece is both difficult and fun! A personal friend and violist/violinist loved the work as well as did the audience, as was evident in the applause that almost refused to end. We experienced something new and different with a novel orchestration that opens up new vistas for the viola as a solo instrument. web-site: www.brettdeubner.com. Maestro Butts can be contacted at: boblute@aol.com. January 28, 2019 at 11:50 PM · Always great to have new piece for viola! January 29, 2019 at 01:16 PM · George, nice article. You're right that violas are not given the orchestral solo spotlight very often, and when they are, there's about a 95% chance that the piece will be the Walton Concerto. I'm not familiar with the "Walton Concerto" but I have the feeling that I'm not missing anything. All I can call to mind is the infamous "Harold in Italy" which is said to have broken all friendship between Paganini and Berlioz. I do hope that somebody schedules the Butts concerto because it is an audience pleaser albeit a challenge for the violist. FWIW: in the interim my oldest student has expressed a desire to learn the viola and I have now actually played one because a friend loaned him a 15.5" to use for initial lessons with another friend who teaches viola and violin. Of course I had to try it myself. Am I going to convert? No, but it is an interesting instrument. January 29, 2019 at 10:48 PM · George, thank you so much for writing about this new concerto! I have shared it with all my violist friends (both of them). Well done!! January 30, 2019 at 02:38 PM · That's an imposing looking viola! Love it. January 30, 2019 at 09:49 PM · I fell asleep in Cuba during Harold in Italy! Thank heaven for the 6th. Brandenburg and the glorious Mozart Eflat Concertante! (And don't forget to tune up a semitone and do it in D ("scordatura"
January 30, 2019 at 11:30 PM · Compared with the "Scene in the Field" and some bits in the "Romeo and Juliet Symphony", "Harold" is one of Berlioz's more interesting. And if Paganini felt it didn't suit his style, as being too easy, please remember Liszt didn't mind arranging it for viola and piano (I wish I'd known about that arrangement when in 1962 I took my manuscript copy of "Harold" to an audition without accompaniment - would have really scared the living daylights out of the accompanist). Please remember there are Telemann and Bartok viola concertos as well.